Muscle activity creates high-frequency vibrations, which are not noticeable at first. If the muscles are tired, the frequency of the oscillations becomes slower. The muscle vibrations of tired muscles become tangible. The muscles have no power. Compression stabilizes muscles from the start. You save energy resources. This provides ideal conditions for high performance. 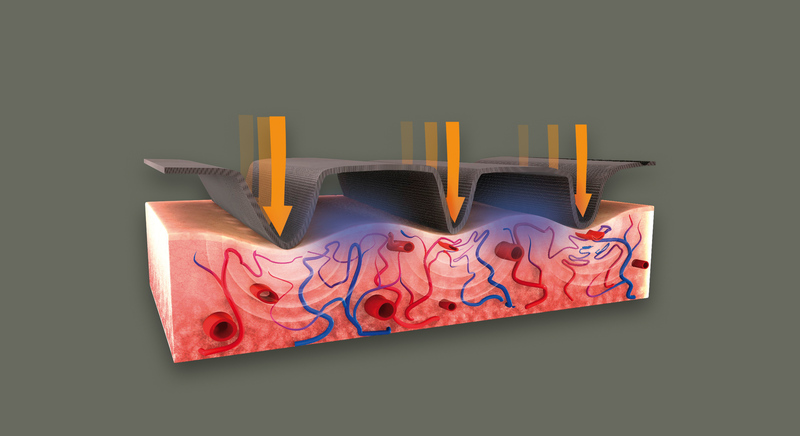 This kind of compression has a stabilizing effect on the blood vessels. Support of the blood vessels reduces the stress on the cardiovascular system and improves the supply of oxygen and nutrients. Muscles and organs are supplied more rapidly with performance-enhancing oxygen and nutrients thanks to the rapid return of venous blood flow back to the heart.